View the entire table of contents for the Nov. 15, 2009 issue. Winemaker Andy Erickson’s résumé reads like a who’s who of great Napa Valley Cabernet estates. In 2001, he was named winemaker at Spottswoode after working at producers such as Harlan Estate and Staglin. In 2006, he became winemaker at Screaming Eagle. The 42-year-old is also in charge at Ovid, Dancing Hares, Dalla Valle and Arietta, and consults on Jonata in the Santa Ynez Valley. In addition, Erickson operates two of his own labels, Leviathan and Favia (which he runs with his wife, Annie Favia, a top-notch viticulturist). The two just planted a single acre of dry-farmed Sauvignon Blanc in Napa’s Coombsville district. 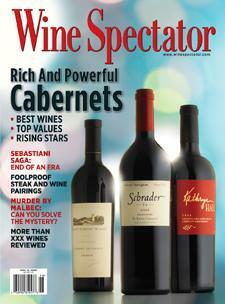 For the full article, check out the new issue of Wine Spectator, on newsstands October 27, 2009.